As it turns out, bacon does make most things better. 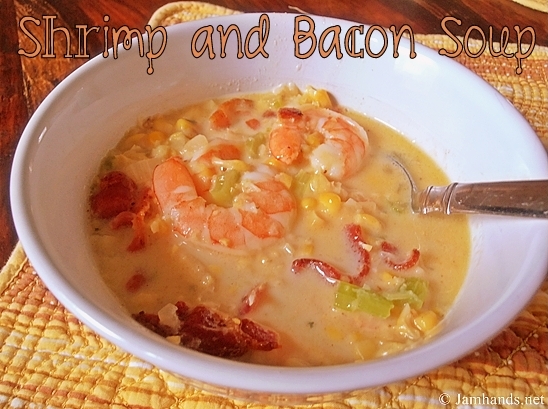 Today we have a lightened up recipe for Bacon-Corn Chowder with Shrimp, recipe courtesy of Cooking Light. It is delicious and light while still being filling. Ready ready? 1. Heat a large Dutch oven over medium-high heat. Add bacon to pan; saute 4 minutes or until the bacon begins to brown. Remove 2 slices bacon. Drain on paper towels. Add onion and next 3 ingredients (through minced garlic) to pan, and saute for 2 minutes. Add corn, and cook 2 minutes, stirring occasionally. Add broth; bring to a boil, and cook for 4 minutes. 2. Place 2 cups of corn mixture in a blender. Remove the center piece of blender lid (to allow steam to escape), and secure lid on blender. Place a clean towel over opening in the blender lid (to avoid splatters). Blend until smooth. Return pureed corn mixture to pan. Stir in shrimp; cook 2 minutes or until shrimp are done. Stir in half-and-half, pepper, and salt. Crumble reserved bacon over soup.